Left Behind or Approaching the Tipping Point? 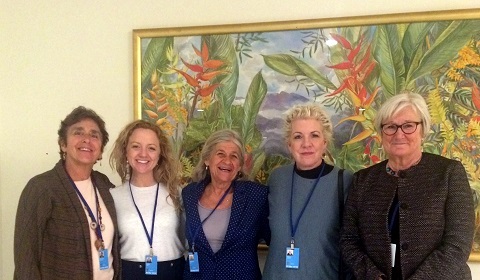 With Jennifer Clement, PEN International’s President, featured on a UNESCO sponsored panel “Safe Journalists” as one of the events at the 62nd session of the United Nations Commission on the Status of Women (CSW), and with Sarah Clarke from the PEN office in London, Elisabeth Lofgren from Swedish PEN, and both Elizabeth Starcevic and Lucina Kathmann from San Miguel PEN on hand, it looks like PEN International is riding high at the UN these days. Exciting times for PEN. And yet, how is the UN Commission on the Status of Women itself doing? This year’s focus topic is the condition of rural women and girls. Yet when Elizabeth and I went about looking for these rural women and girls, eager to analyze PEN’s slant on their situation, we found these women in very short supply. Many had been invited, funds had been raised, passports had been granted, forms had been filled out. But the women themselves did not arrive. In many cases privileged women from cities were having to talk for them, an old stopgap measure which might be better than nothing, but it definitely puts the lie to this year’s motto “No woman left behind.” Women experts on unpaid labor, agriculture and land rights have definitely been left behind. We know what happened: they didn’t get visas. Last year women from the seven countries blacklisted by the US administration didn’t get visas. This year many more were excluded, women from all over the world. It does not seem that any region is particularly targeted. The target is rural women from everywhere and the specific issue cited for denying them access is that many have no bank accounts. The CSW meets in the UN complex in New York. To participate, the women must come into the US. The US simply does not believe –this year, anyway– that a woman without a bank account plans to return to her country, and thus her visa application is denied. Many of the rural women are not married, another factor which has been cited in the denial of some applications. This is a type of vulnerability that the UN never foresaw. Because of the geography of the situation, one single country has the power to impoverish the programs for which perhaps 11,000 NGO representatives traveled to New York. (Over 9,000 representatives registered.) The sessions are still of interest and importance but they are seriously damaged. At the same time there there is also a mood of jubilation. The reason is that in many countries the Me Too movement and other campaigns have generated a wave of protest against sexual harassment that has involved naming names in high places. There have been mammoth women’s marches in every continent. High profile people in the entertainment business, sports etc. have joined and used their special access to the public’s attention to raise awareness of problems the CSW has talked about every year since its inception 62 years ago. Assistant Secretary General Phumzile Mlambo-Ngcuka, head of UN Women, the UN umbrella organization for programs for women, said that society may be approaching the “tipping point.” Changes for women, though inevitable, have been very slow in coming. Maybe the pace is finally stepping up. Mlambo-Ngcuka suggested that all of us help keep up the momentum by referring to this tipping point as often as possible. Send concrete details about any woman who was refused a visa to attend the CSW 62. These cases are being analyzed by two organizations: FEMNET and CIVITAS. Talk and write about the “tipping point.” I’m not so sure what it is either but maybe together we can make it happen.